Wow, the final…where on earth have the last 8 weeks gone? This final week May and Patrick didn’t just want to see their sewing skills, but their hand finishing skills. Couture all the way! The Purl Bee have a free pattern for a Men’s necktie. It’s constucted slightly differently to the one on the show, but you get the same result…a necktie! There’s also a great tutorial on The Sewing Space for how to sew a Men’s tie and how to get that point just right! The contestants had to sew a bar tack at the base of the hand stitching. Bar tacks are used at stress points in garments. There’s a great explanation of Bar Tacking and a list of potential applications on the WiseGeek website. Could you cut up a wedding dress? More pertinently could you cut up your own wedding dress? I’m really not sure I could cut up my wedding dress, but I certainly could have cut up the one that I saw today displayed in one of the local charity shops in town….it was a proper 80s affair! 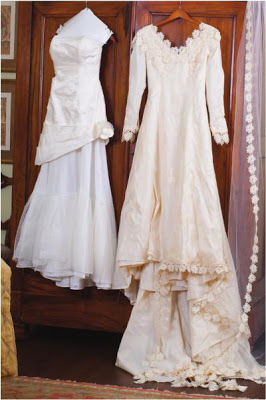 Sew Beautiful have a post on turning a wedding dress (or two) into a Christening gown. There are some useful tips at the bottom of the post. Craftsy has a few online courses covering all sorts of techniques. They have a course on The Couture Dress which covers a whole host of couture techniques. There are of course also lots of books on couture techniques. I did a quick search on Amazon for Couture Techniques and I now have many more books on my wish list! As for the result….Congratulations Heather! Experience has won out again! Like with so many things in life the more often you do it, the more you learn and the better you get. Just keep on sewing! Well, I hope you have enjoyed The Great British Sewing Bee at least half as much as I have done! Just a year to go until series 3 is on the television….what on earth will I do every Tuesday night…sewing perhaps? Have you checked out my Great British Sewing Bee pinterest board yet? I have pinned lots of great tips that follow the series. There is no excuse for not dusting off your sewing machine! Maybe we will see you on a future season of the GBSB! Thanks again for all of your round up posts. Wasn’t it a great series? I was sad that Chinelo didn’t win though. I am so tempted to try a tie. I had no idea they were so tricky to sew! Thanks for the link to the free pattern. It was a really good final episode, although I’m really sad to see the series ended. I too was hoping Chinelo would win, but Heather really made fabulous final gown. It’s taken me a while, but I’ve just posted my own recap on Random Crafting Adventures. School holidays have meant much less time to potter on my own!